The winter continue to strikes where it hurts – our skin! This definitely includes our lips, as they get super dry and cracked in this weather! Luckily, Elyssa from BeautyReviews.ca has put together her list of best drugstore lip products to carry you through the Winter! She is my first ever guest blogger here at spilledpolish! This post is full of great information, so keep on reading! Whenever the winter hits in full force, my lips instantly get itchy and start to peel and crack. I’ve decide to be prepared this winter with a few options that will ensure my lips remain soft. All of the products that I find work the best can be found in the drugstore which won’t break the bank. Of course, it is important to remain consistent with your lip balm application to ensure that winter dryness doesn’t have a chance to ruin your lips. If you’ve ever put Vaseline on your lips you’ll know that it can be a bit sticky and it’s not always pretty. However, Vaseline came out with a tin case and a slightly different formula to solve this issue of that dreadful finger in jar feeling. 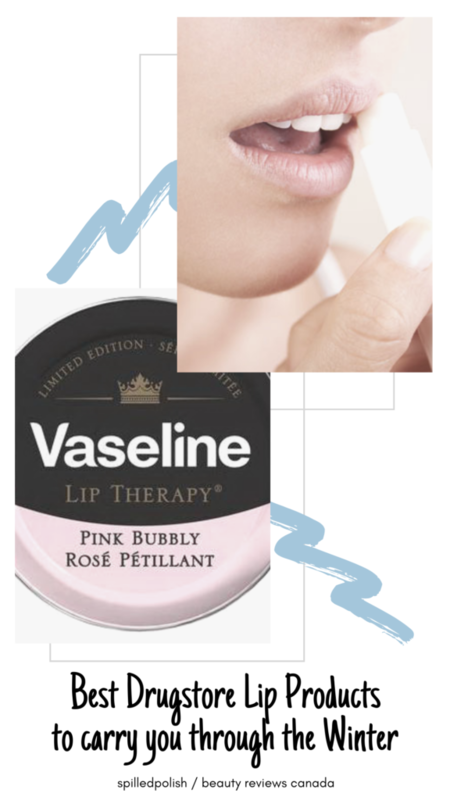 The Vaseline Lip Therapy is a harder jelly that is packed tighter than traditional Vaseline. This makes it easier to apply and also allows some key ingredients to shine through such as cocoa butter and aloe which are some of the different flavours that you can pick up. Right now, I’m using the limited edition called “Pink Bubbly” that actually smells like roses and champagne. I love applying this just before I head outside because it doesn’t absorb into the lips too fast and provides an extra barrier to protect me from the wind, which is a major plus. 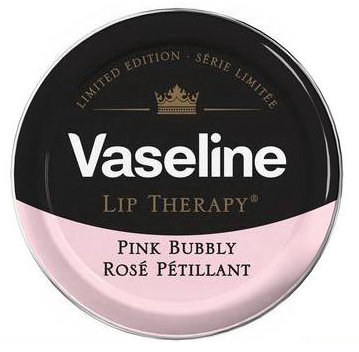 In Canada, the Vaseline Lip Therapy Runs just around the $5 mark depending on where you go (I suggest Walmart Canada). 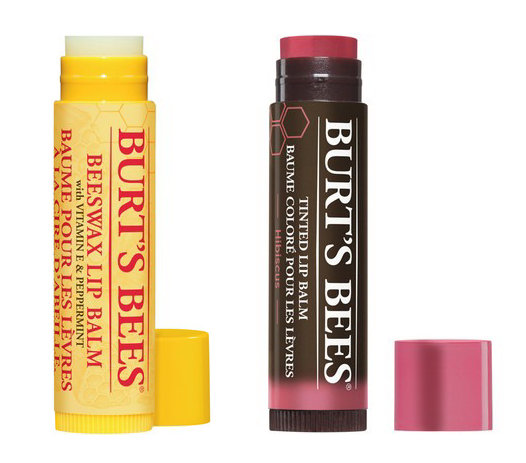 Burt’s Bees has always been my go to lip product for cold weather. I love the original Burt’s Bees Lip Balm because it has a minty tingle which makes my lips feel great especially when they are itchy. Burt’s Bees has also come out with a number of different flavours in case you’re looking for something a little more fun such as my favourite Vanilla Bean. Also, you definitely cannot ignore the tinted Burt’s Bees Natural Tinted Lip Balm that includes 6 deeper berry colours that turn out to be more sheer than they appear in the stick. The Revlon Kiss Exfoliating Balm is a sugar scrub that helps keep lips smooth with an additional 24 hour hydration. You can use it alone or before you apply lip colour as a prep because the scrubbers help smooth out lips from winter dryness. The most popular flavour for the Revlon Kiss Exfoliating balm is in Sugar Mint but the good news is that on the Shoppers Drug Mart website it now comes in 6 colours including: Tropical Coconut (a soft pink), Juicy Peach (a light peach), Fresh Strawberry (a pretty pink), Sweet Cherry (a brighter pink) and Berry Burst (a raspberry tone). There you have my top 3 picks to keep your lips looking supple all winter long. I hope these products work for you and if you have any other drugstore lip balms that are your faves leave them in the comments below! Elyssa Sugar is owner of the beauty reviews website called: Beauty Reviews Canada (https://beautyreviews.ca). You can also follow her on Twitter and Instagram as she regularly posts new makeup and skincare reviews which she also talks about on her Podcast.